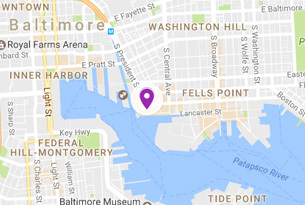 R. Champlin “Champ” Sheridan (1930 – 2013) was a 1952 graduate of the School of Arts & Sciences, a trustee emeritus, and a generous benefactor to Johns Hopkins University and to the libraries that today bear his name. Sheridan, a Baltimore-born printer and son of a printer, supported the university’s libraries in part because of what he called “sort of a natural affinity” for books and periodicals. 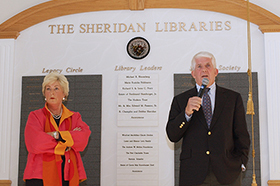 Along with his wife Debbie, Sheridan transformed the libraries at Johns Hopkins University through multiple gifts. In 1998, the university honored the Sheridans by collectively rechristening as the Sheridan Libraries the Eisenhower Library, the Albert D. Hutzler Reading Room, the John Work Garrett Library at Evergreen Museum & Library, and the George Peabody Library. The Brody Learning Commons, completed in 2012, has since been added to the Sheridan Libraries family. For the unveiling of their portrait in the Eisenhower Library, the Sheridans and their beloved dog, Kermit, hosted a barbecue on the Beach for students. Learn more about Champ Sheridan’s life and legacy in this profile on the JHU HUB website.